Returning back to TV after more than two and a half decades, an all new Lupin III series is set to air and bring back those mischievous and exciting adventures to the small screen. Dubbed as the “Lupin the Third, Mine Fujiko to Iu Onna,” this new series reveals the change of voice cast for the first time in 16 years. Sayo Yamamoto of the series Michiko to Hatchin, is said to direct the entire 13 episodes of the series, which makes her the sole female director of Lupin III adaptations. Assisting Yamamoto is Takeshi Koike, who will serve as the character designer and the animation director. Mari Okada of Ano Hana will lead the series composition. Lupin will be played by Kanishi Kurita, Kiyoshi Koboayashi will take the role of Daisuke Jigen and Daisuke Namikawa will be Goemon Ishikawa. Fujiko Mine will be played by Miyuki Sawashiro, and Kouichi Yamadera as Inspector Zanigata will complete the whole cast. This new chapter focuses on the woman member of the group and the apple of Lupin III’s eye, Fujiko Mine, who in her own means, is a capable thief in her own. A flashback in time, the series depicts Lupin III and his gang in their younger years. It is mean to capture the sensuality which is evident in the original manga created by Monkey Punch. The daringness of youth will be apparent in this new interpretation of the hit franchise. 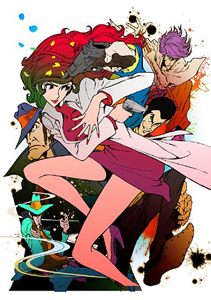 Lupin III was created by Monkey Punch (Kazuhiko Kato), trailing around the adventures of Arsene Lupin III and his gang. The lead character is said to be the grandson of Arsene Lupin, the lead character of Maurice Leblanc’s novel series. Lupin III travels all over the world, stealing treasures, while evading from his ever-strict adversary, Inspector Zenigata. The last of the original Lupin III animated series aired in 1985. The new series will be shown in NTV this coming April.